The idea behind the thermostatic radiator valves (TRVs for short) is simple – attached to your radiators, they can efficiently keep track of the temperature in the room (or rooms) where they are located. But are thermostatic radiator valves worth it? An integral part of almost any central heating system, they provide homeowners with the luxury of maintaining different room temperatures under the same roof. Why should you install thermostatic radiator valves in your home? By fitting a radiator valve, you will not only maintain a room temperature that feels just right, but also scratch off a few extra digits from your monthly fuel bills. For instance, did you know that, if you turn your thermostat down by just one degree, you can reduce your heating expenses with almost £85 each year? Why stop here – if you install a room thermostat to back-up your already efficient TRVs, you will be looking at a potential heating bill reduction of £165 per year! However, do keep in mind that you will also need to fit at least one valve in your property to meet UK’s recently updated building regulations. If you need an electric cooker, oven, hob or hood repair service, we can help you with this, too. TRVs allow you to set and maintain a custom room temperature at any given time. As soon as your radiator reaches the desired temperature, the thermal valve will immediately cut off the radiator's water supply, preventing you or your radiator from overheating. Thermostatic radiator valves also come with a wide temperature setting, which allows you to easily heat up your room from 5 all the way up to 280°C! How to fit a radiator valve? Fantastic Handyman has the expertise needed to install any type of thermal valves by all manufacturers. From programmable valves that will automatically regulate the temperatures at designated hours to those that work via a wireless connection, the qualified technicians will be able to place any type of TRV away from your thermostat to ensure that you get accurate readings 100% of the time. How hard is it to replace a radiator valve? If left to its own devices, even the sturdiest radiator valve can easily break down. For example, your radiator knob could easily get stuck on the lowest setting and cause leaks. A faulty thermostatic radiator valve could also prevent your radiator from heating up properly. Your knowledgeable specialist will closely follow the radiator valve change kit instructions to properly install, maintain, or replace your chosen TRV. What can the qualified professionals do to help? 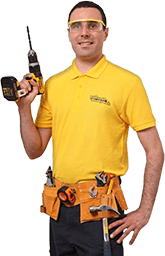 Each handyman that we send to modernise your radiators has been working in this field for quite some time and knows all the safety regulations by heart. For example, you can hire your pro to perform a complete replacement of radiator valve caps or steam valve repair. Replacing a TRV without a draining system and removing a radiator thermostat are also tasks within the expert’s scope of expertise. Check your replaced radiator valve for any signs of leaks. With a TRV valve, you can fine-tune your heating system to spend less fuel and achieve better results. But you need to properly position them in every room. For instance, a radiator hidden behind a lofty wardrobe will not be nearly as efficient as one that is “out in the open”. So, if you are still getting the shivers even though your heating system is turned all the way up, then you should probably adjust your layout a bit.